I mentioned in an earlier post that I started playing golf when I was 10. That September, my Dad asked me if I wanted to see a golf tournament – see the professionals play. I said, “Sure,” so we went to the 1960 Portland Open Invitational at the Portland (Oregon) Golf Club. When we got there, we went straight to the range to watch the players warming up. There were caddies downrange, one for each golfer, because they had to provide their own balls back then and the caddies were out there picking them up. I was worried the caddies would get hit, but their player hit shot after shot right to them. Unbelievable. The third tee was right next to the range, so we started following some group, I forget who was in it, and on the next hole, the second hole of tournament golf that I had ever seen, one of the guys made a hole-in-one. No kidding. What fun! Arnold Palmer was there. He had won the Masters the year before, but was a year away from becoming ARNOLD PALMER. 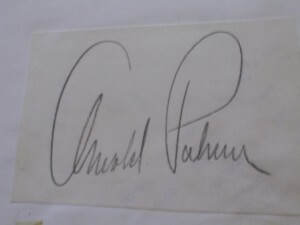 I knew who he was, though, and on the eighteenth hole I walked into the fairway at Pop’s urging to get his autograph as he walked from the tee to his next shot. There were no gallery ropes in those days; you just stayed a respectful distance away when the players were hitting and then followed them down the fairway. He was walking to his tee ball and I went up to him and asked him for his autograph. He asked me kindly to wait until he was finished playing and he would sign for me. So I went up to the green and stood a good distance away to not get lost in the crowd. I waited, and waited. I heard some commotion from the gallery around the green, so I guess something had happened. Some applause, and everything was quiet again. Not a few moments after that, here comes Arnold Palmer, alone, walking straight for me. He had said he would sign for me, he found me, and he signed. 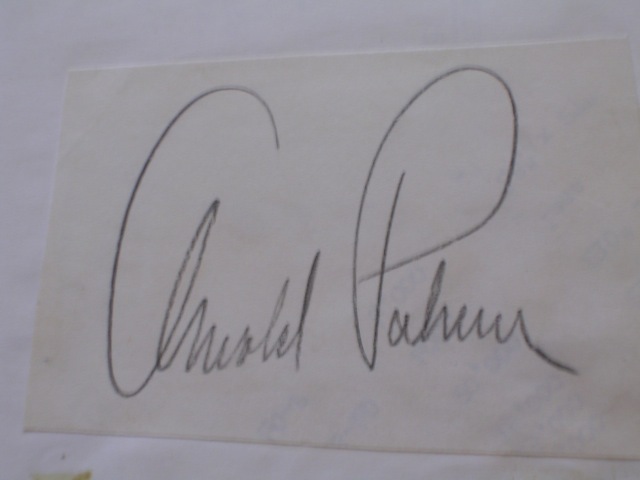 You can’t imagine how happy I was to get his autograph, and it took me until I had grown up to realize what he had done. He had kept his promise and he had to find me to keep it. Instead of thinking that I had left, he went looking. That’s why he’s The King. You bet I still have that autograph. Oh, yes. Palmer shot 270 to finish in fourth place, four strokes behind winner Billy Casper, Jr. Palmer won $1,150 and Casper’s first-place check was worth $2,800. The capital “A” is 1-3/4″ high. My son is learning how to play golf. He didn’t start until he was about 30 years old. He is fairly athletic and hits the ball a long way, but neither he nor I have any idea of where it’s going to end up much of the time. The reason for that, and the one thing that he is struggling to learn, involves his right (trailing) wrist. This post is not about him, though. It’s about over half the recreational golfers I play with who do the same thing he does. They flip that wrist. In an earlier post, I talked about pronation and supination. This is one of my most-read posts, because it is something that Ben Hogan went into at length in his book, Five Lessons. The Hogan mystique makes many amateurs think this is the magic move that if they get figured out, will change everything. For once, they’re right. In practical terms it all means a backward bend in the trailing wrist MUST BE MAINTAINED through impact. This is a golf swing imperative. You cannot play good golf if you don’t do this. How do you get it right? Search the blog on “hands leading the clubhead”. See this video, or this one. If your ball flight is a guessing game, chances are that flipping is your number one problem. I even see guys flip when they putt and they can’t putt worth a lick. 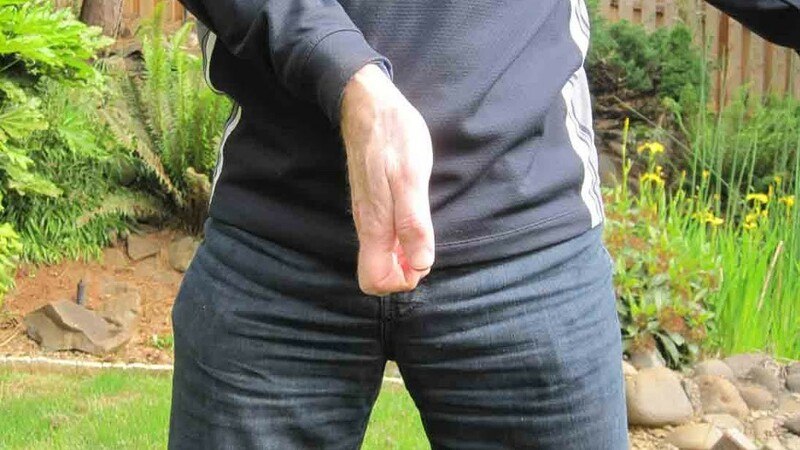 Put this move into your golf swing and you will be a different golfer. Golf will become a different game. I absolutely guarantee it. An obstruction is anything artificial except fences, walls, stakes, etc, that define out-of bounds. An obstruction that cannot be moved with reasonable effort or undue delay or without causing damage is an immovable obstruction. You get relief from an immovable obstruction when the ball lies in or on it, or if it interferes with your stance or the intended area of your swing. Common examples are cart paths, sprinkler heads, bridges, and exposed drainage lines. Relief in this circumstance is complicated and depends on where the ball is. In the following four cases, the ball may be cleaned after it is lifted. 1. If it lies anywhere but on the green, in a bunker, or on the teeing ground, the player may lift and drop the ball within one club-length of the nearest point of relief, but not nearer the hole, without penalty. The nearest point of relief in this case may not be on the green or in a hazard. 2. If the ball lies in a bunker, the ball may lifted and dropped as in 1., but the drop must take place within the bunker. Alternatively, the player may choose to drop the ball outside the bunker, on a line connecting the spot where the ball lies and the hole, such line extended as far back as the player chooses, with a penalty of one stroke. 3. If the ball lies on the putting green, the player may lift the ball and place it (NOTE: not drop it) at the nearest point of relief without penalty. The nearest point of relief may be off the green, but not in a hazard. 4. If the ball lies on the teeing ground (example: you hit a dribbler that trickled over right next to the pole holding the ball washer that happens to be on the teeing ground), you may lift and drop the ball without penalty in accordance with 1. You may not take relief if interference by anything other than an immovable obstruction makes the stroke impracticable, or if you are taking relief to make a stroke that is clearly unreasonable or which requires an unreasonable stance, swing, or direction of play. If the ball is in a water hazard, relief must be taken according to rules for water hazards, not the rule for immovable obstructions. There are twenty-six Decisions concerning immovable obstructions. The spirit of the rule governs them. Here are a few examples to give you the idea. Player determines nearest point of relief but is unable to make intended stroke. No further relief allowed. Relief from the obstruction incidentally gives the player relief from interference in the original line of play. No problem. Relief from one obstruction lands the ball in a spot interfered with by another obstruction. Take relief again. Player needs relief for a ball lying on a bridge. Relief must be taken directly underneath the spot on the bridge where the ball lies. Maybe you should play it off the bridge. Object interferes with abnormal stoke, but an abnormal stroke is reasonable under the circumstances, e.g., to play toward the hole you must hit the ball left-handed. Relief may be taken. The player may then take a right-handed stroke unless that stroke is interfered with in which case relief may be taken again. Let me end this long post with a story from the European Tour. It was in Sandy Lyle’s Golf Hall of Fame 2012 induction speech. When you start playing golf, you have to learn the basics: how to hit the ball, how to get the ball in the air, how to putt, how to chip. Getting lessons on these basics is the best way to learn them, and you should keep taking lessons on these skills until you’re fairly good at them. “Fairly good” means that more often than not, you know here the ball is going to go when you hit it. If you have developed your game to that point, you’re probably breaking 90 with regularity. You should continue to take lessons, but change your focus radically. You already know how to swing, so you don’t need any swing lessons. What you do need is a lesson on how to hit your fairway wood off the ground. This is a tough shot. Get a lesson on it. You don’t need a chipping lesson, because you can do that, but how about a lesson in chipping from greenside rough? How about a lesson in hitting uphill and downhill putts? See where I’m going with this? You should be learning shots, not swings. When you play golf, you don’t go out there to swing the club. You’re there to hit the ball toward and into the hole. Most of the time you’re not making a routine play at the ball. You have to make a shot. Once you have the basic skills figured out, the focus of a lesson needs to be doing just that — using the skills you have to hit shots. On TV, golf looks simple. You know how much harder it is in real life, and how many different kinds of shots you have to play in eighteen holes. Every swing, every stroke at the ball is generally tailored in some way to the shot at hand. The more different shots you can hit, the more you will be able to take whatever the course throws at you. Having a solution for every problem is a comforting way to play golf. It’s knowing how to hit shots that gives you a good score, not knowing how to swing the club. 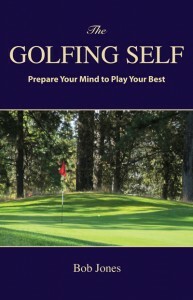 You might have one shot you want to work on, which you can have your pro teach you at the range. Even better is to have a playing lesson where you go out on the course, drop a ball at a particular spot, and say to the pro, what shot should I hit from here, and show me how to hit it. You can cover five or six shots that way and it will be the most valuable lesson you ever had. I say again, after you get to a certain skill level, don’t learn swings, learn shots. Becoming a shot-maker is how you get better from there. An obstruction is something that is artificial, except for walls, stakes, fences, etc., that define out of bounds. Growing trees, bushes, weeds, and such are natural objects and are not obstructions. They are part of the course. If an obstruction can be moved without unreasonable effort, without causing delay, and without causing damage, it is a movable obstruction. To get relief for a ball lying beside a movable obstruction, you may move the obstruction. You do not get to lift your ball and drop it elsewhere. If the ball moves because of your moving the obstruction, you must replace the ball with no penalty. If the ball lies in or on the obstruction, you may lift the ball and move the obstruction. The ball is then to be dropped as near as possible to the spot directly under where it lay in or on the obstruction, and not nearer the hole. You may clean the ball when so lifted. If the ball is moving, an obstruction that might influence it, other than the flagstick or equipment of any of the players, may not be moved. The penalty for doing so is two strokes. All this is in Rule 24-1. Now for the fun stuff. An incorrect ruling regarding this rule helped Ernie Els win the U.S. Open at Oakmont in 1994. Els drove his ball into the left rough. His shot to the green was blocked by a camera tower. The tower was mounted on a tracked vehicle, which could have been moved without delay, but the tower was ruled to be an immovable obstruction (to be discussed next week). Els got a free drop to a better lie which most likely saved him a stroke on the hole. He went on to beat Colin Montgomery and Loren Roberts in a playoff. Deep Rules: You may not hold onto the ball when you move an obstruction. That would be a violation of Rule 18-2a, and a two-stroke penalty would apply. A ball can become lost in an obstruction, but there must be reasonable evidence that this occurred. A surmise is not good enough. Without reasonable evidence that the ball was lost in the obstruction, the ball must be treated as a lost ball. If the ball is lost in the obstruction, the obstruction is to be moved and another ball dropped as near as possible to the spot directly under the place where the ball last crossed the outermost limits of the obstruction, but not nearer to the hole. It is not unusual for a course to have a par-3 hole where the tee is elevated above the green. This throws a wrinkle into your club selection, and that’s not all. The way you play the shot needs to change, too. A golf ball in flight obviously has a vertical component of motion and a horizontal one. When the ball descends, it is going down, but still forward as well. A green that is lower than the tee allows the ball to fall down farther, which at the same time will also carry it farther forward. That means you need less club for a given distance. A general rule is to use one less club for very 50 feet of elevation difference. If the tee is on a level with A’, B’, and the green at A, B, you can see that a club which would leave you short on level ground will be just right once it has completed its extra fall downward. It’s hard to describe 50 vertical feet looks like, and hard to tell just by looking because the difference is stretched out over the length of the hole. I’m something of a nut on this, so I go to library and pull out the USGS topographic map containing the course and estimate using the 40-foot contour lines. Maybe an easier way is just to use one less club as a rule the first time you play the hole, then adjust from there. The other danger that an elevated tee presents is that the ball spends more time in the air before it hits the ground. Every aspect of its flight gets exaggerated. We’ve dealt with forward-back motion with club selection, but there’s side-to-side motion as well. Your fade that lands nicely on the green could fade itself right off the green by the time it hits the ground when launched from an elevated tee. It makes sense, then, to keep the ball as low as possible with this shot. This is especially true if there is any wind blowing. One course I play has a par 3 with an elevated tee. In the afternoon there is a strong afternoon wind that blows from right to left. You have to aim about ten yards off the right side of the green to have a chance for the tee shot to hang onto the left side of the green. All the way around, hit a low-flying shot off the tee, or even a fairway, into a green that is significantly below your feet. 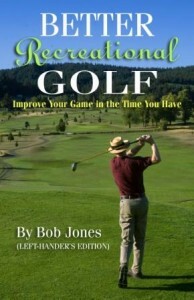 Those of you who have a copy of Better Recreational Golf on your bookshelf should look up the Hard Chip. This is the shot to play. For the rest of you, this shot is like a greenside chip except bigger. Take the club back to where your hands are hip-high then hit down and through, not releasing the club. There is little or no wrist break. The follow-through should end hip-high on the other side. The hole I mentioned above is 120 yards long. A Hard Chip with my 7-iron, which normally goes 150 yards, is just right. All that said, I leave to you figure out the Mother of Elevated Tees, this hole at the Legend Golf Course in South Africa. It is 1,400 feet from the tee down to the green. You need a helicopter to get up to the tee. And to get back down. When the green is higher than the fairway or tee you’re standing on, you have a problem to solve. Elevation adds yards to the shot. As the ball descends, it is also still going forward. 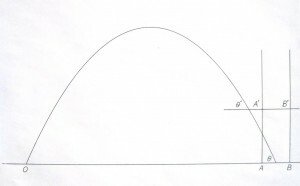 When the ground the ball will land on is higher than the ground the ball took off from, the descending arc gets cut off. The ball will not fall as far, and it will not carry forward as far, too. You therefore have to do two things when hitting toward higher ground: take more cub, and hit a ball with a higher-than-normal trajectory. But first, you have to read the slope. This diagram below shows how an elevated green changes things. The curve does not truly reflect actual ball flight, but the general idea is the same. A ball starting off at point O on the left will land on the green between points A and B. If the green is elevated, now defined by points A’ and B’, a ball hit in the same way will land short of the green. Also, its angle of approach to the elevated green, θ’, is shallower than the angle of approach to the coplanar green at θ. One kind of elevated green is easy to see. The fairway runs reasonably level toward a sharp upslope that the greens sit atop of. Another kind can fool you if you aren’t paying attention. This would be a green that sits at the end of a gentle but constant rise from where the ball is, up to the green. A three-degree slope doesn’t look like much, but it rises almost 8 yards over a distance of 150 yards. A higher target requires more club. Figure adding one club for every thirty feet of added elevation. Always err of the side of extra club. You might have to hit the ball with a higher trajectory if you are significantly lower than the green. 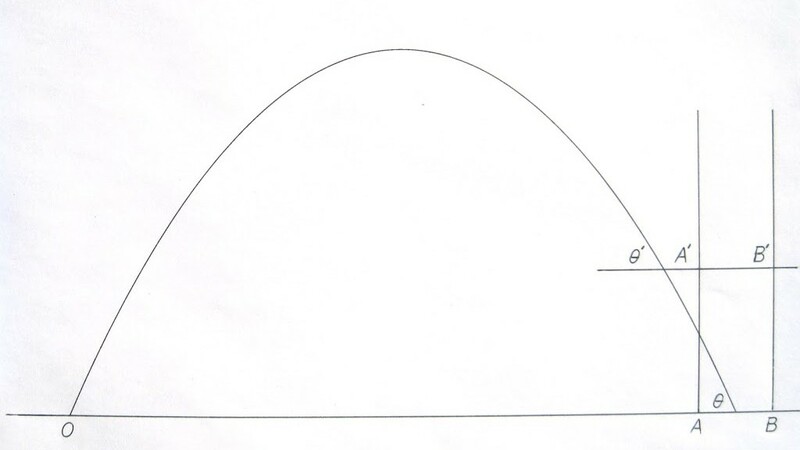 As the diagram shows, the ball will land at a point in its downward arc where it still has a significant horizontal component to its flight, it will run farther than usual after landing. If the pin is in the back of the green, you can aim for the front of the green and let the ball release the rest of the way. If the pin is in front, you have to hit a shot with a high trajectory so the ball will fall down straighter and stop faster. To hit the high shot, take out one more club than the distance calls for. Set up to the ball as you normally would. Step back with your right foot about one inch, moving your body and hands back with it. You are now behind the ball. Swing so that you keep your hands behind the ball at impact. This will add loft to the club so you hit it higher than usual. Do not try to lift the ball in the air. A little over a month ago, I posted on Billy Payne stonewalling the press corps about the Augusta National Golf Club not admitting women as members. Recently, Warren Buffet, the investment whiz, and a member of ANGC, said that the club needs to have “plenty of women” in the membership, but as he is not on the membership committee, there isn’t anything he can do about it right now. I wrote that the world of golf could do something about it by refusing to grant to the Masters recognition as an official tournament in World Golf Rankings, exemptions for major championships, money lists, and so on. So at a press conference held for The Players Championship, which some observers call the fifth major, PGA Tour commissioner Tim Finchem stepped up to the plate on the very issue . . and struck out. Oops. Wrong sports metaphor. He stepped up to the tee on the 17th tee at TPC Sawgrass . . . and whiffed. That the Masters tournament is so “important to golf”, whatever that means, more important than the culture of non-discrimination. Got it. Tim, if discrimination is wrong at Whooping Crane Country club, it’s wrong at ANGC, too. Apparently, the Tour follows a principled policy on discrimination unless it has to apply it in a difficult case, at which time the Tour folds. Principles aren’t for easy cases, though. They’re for the hard cases. If you retreat from your principles in the face of a tough decision, it doesn’t mean that you are unprincipled. It means that you have different principles than you thought you did. This stance shows that Finchem and the Tour do not truly believe in non-discrimination. They just want to make themselves look good by having filed the right paperwork. What does Finchem think the ANCG would do if he held its feet to the fire? Not hold the tournament? Hardly likely, seeing that the Masters is a cash cow beyond any golf club’s wildest dreams. 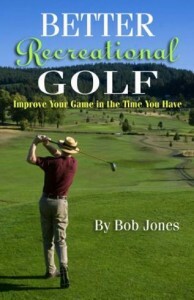 If the Masters was not played for a year or two, “golf” would not suffer. The club would, and Finchem has to know that. Just watch. The subject will come up during U.S. Open week, and I’ll bet dollars to donuts that the USGA will say the same thing as Finchem. I guess I’ll have to get out the the USGA address again and ask you to write, especially if you are a USGA member, to ask that the Masters champion be removed from the list of automatic exemptions, beginning with the 2013 U.S. Open competition, until such time as it admits female members. You may also telephone them at 908-234-2300, FAX 908-234-9687. The embarrassing error of hitting the wrong ball comes about for one of two reasons. Either the person hitting the ball wasn’t paying attention, or the ball that was hit was not properly identified. There’s really no other way this can happen, and the fixes are easy. 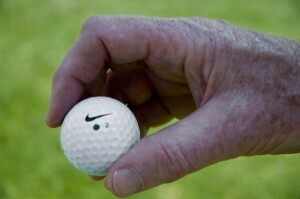 Put an identifying mark on your ball with a colored felt-tip pen. This is suggested by Rules 6-5 and 12-2. It can be a dot, two dots, something that makes your ball stand out from the others being played by the members of your group. I fill in a dimple with green ink next to the manufacturer’s logo. Tell the members of your group what ball you’re playing and show them the mark before you tee off on the first hole. When you get up to the ball that you think is yours, look at it. Check to see that it is the same brand as yours and has the same mark you drew on it. Get into the habit of checking before you hit any shot. Check before you hit your tee shot to be sure your ball is marked. Check on every shot up to the green. Once you get to the green, check to be sure the ball you’re about to mark and pick up is yours. Let’s say that despite these precautions, you hit someone else’s ball. What now? You must correct the mistake. Go to where your ball lies and play it, taking a two-stroke penalty. The stroke you made on the wrong ball does not count on your score. The owner of the ball you hit must place a ball on the spot where the wrong ball was hit and play from there, with no penalty. If you do not correct your mistake before you tee off on the next hole, you are disqualified. These procedures are found in Rule 15-3. So far, so good. Now let’s have some fun. What happens if you hit a wrong ball, correct it by hitting your ball, but come to realize that wasn’t your ball, either. You’ve hit a wrong ball twice in a row. Fortunately the Rule book is kind. You only have to take one two-stroke penalty for hitting a wrong ball, not a four-stroke penalty for hitting two wrong balls. Deep Rule: Say you and another player in your group are playing the same brand and number of ball, and neither are marked. (You can sense something bad is about to happen, can’t you?) Say that you both hit up to the green and each ball settles into deep rough on the right side. You both go up to where the two balls are lying and see that they are about a foot apart, but which ball is whose? You don’t want to take a penalty for hitting a wrong ball, so what do you do? That was a trick question. Right ball or wrong ball is not the issue here. If you cannot identify which ball is yours, it is a lost ball (Definitions). Since neither of you marked the ball in play, each ball is lost and each of you must take a stroke-and-distance penalty. This situation, or some form of it where a player is confronted with two balls and is unable to say which one is his/hers, happens more often than you would think in amateur competition. Please. Always put an identifying mark on your ball. Always check to see that the ball you’re about to hit is yours. It’s so simple to do, and it saves you so much grief. Most people will tell you that reading greens is an art that can never be reduced to science. While that is mostly true, there is more science in it than you might imagine. Say you’re on an idealized green that is perfectly flat, but a bit tilted. It is entirely possible, knowing the speed of the green, the amount of its tilt, and the speed of the putt, to calculate the exact path to the hole. In 1984, H.A. 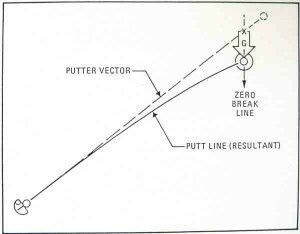 Templeton published a book titled Vector Putting, that lays out a plan which shows you how to analyze a green in just those terms. The keys are what Templeton called the zero-break line, and the gravity vector. I will explain them in a simplified, but still accurate way, retaining the term, “zero-break line”, but replacing “gravity vector” with “aiming point”. The zero-break line is the line that follows the slope of the green straight downhill. The aiming point is the spot on this line, extended now above the hole, where you aim your putt. Find the zero-break line on a sloping green by walking below the hole in its vicinity. You will at first sense that you are walking downhill, but when you sense you are now walking uphill, you have crossed, and thus found, the zero-break line. The aiming point for your putt is a spot on the green on this line but on the uphill side of the hole. The precise location of this spot, as said before, depends on the speed of the green, the slope of the green, and the length of the putt. 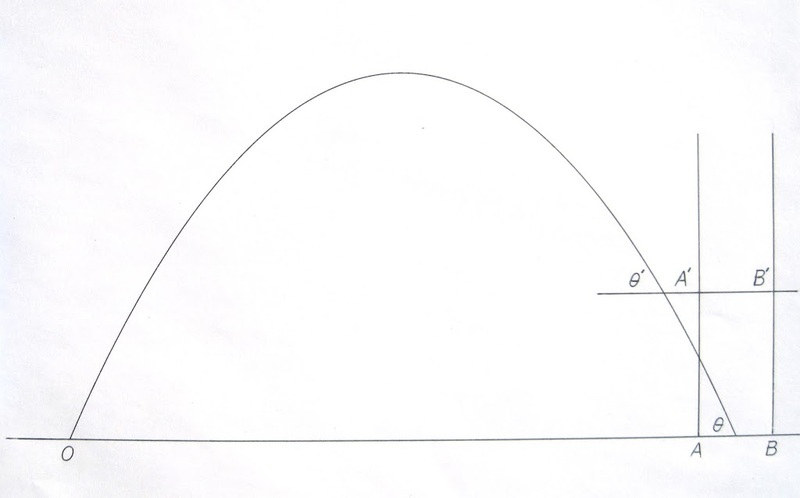 The aiming point (the X in the diagram) will be closer to the hole along the zero-break line when: the green is slower, the slope is less, and the distance is shorter. The aiming point will be farther from the hole along the zero-break line when: the green is faster, the slope is greater, and the distance is longer. The one constant is the speed at which the ball approaches the hole. 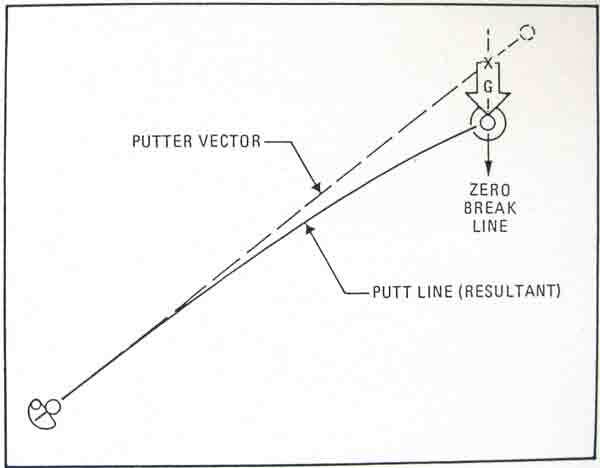 For a 10-foot putt on a medium speed green (normal daily fee course) that slopes two degrees, the aiming point (the X on the diagram) would be six inches above the hole on the extended zero-break line. A ball putted toward this point with enough speed to finish one foot past the hole will go in the hole — regardless of where the ball is in relation to the hole. If you imagine a clock around the hole with the zero-break line running from 12 to 6, it does not matter at what o’clock the ball is. A ball 10 feet away will go in the hole if it starts out toward the aiming point with the right speed. The chart below shows you how to find the location of the aim point on medium greens, as used in the example above. 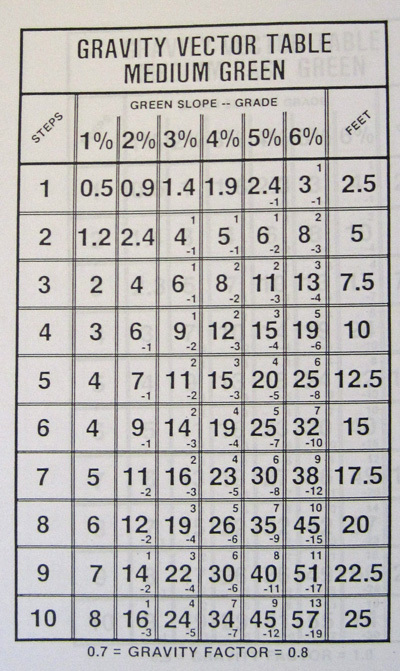 Read down the right-hand column to 10 feet, across to 2%, the slope of the green, and you will find the aim point be 6 inches above the hole along the zero-break line. This method works best for putts of 10-12 feet or less. Over that short distance, the slope of the green is usually constant, making the green act like a tilted plane. Longer putts that might have several different breaks between the ball and the hole do not lend themselves as well to this technique. But for the shorter putts, this method is like money in the bank. There is a refinement built into the chart, which shows you the aiming point for putts at 90 degrees to the zero-beak line. Putts like in the picture above, played from below 90 degrees, or others played from above the 90-degree line will spend a different mount of time rolling across the green. The little numbers in the boxes show you how many inches to add for putts played from above the hole (superscript) or to subtract for putts played from below the hole (subscript), to the basic aiming point to compensate for this effect. Play with this on the practice green. Remember, you are not trying to figure out how far outside the hole to aim your putt, but how far up the zero-break line you are aiming for. You could have one putt that would pass four inches to the side of the hole, and another one passing six inches to the side of the hole, when both times you would really be aiming at a spot ten inches above the hole on the zero-beak line. You might also enjoy Geoff Mangum’s extended discussion of this technique.